Whether you’re buying a home or you’re preparing to sell one, you need someone on your side who is experienced and passionate about home inspections. Scott D. Huff launched Georgia Carolina Home Inspection Service in 1995 after having a personal bad experience with a builder. He was driven by the desire to help people just like you avoid the issues he had faced, and this is still his number one goal. Scott prides himself on being a reliable, experience home inspector. When he’s not helping buyers and sellers, he can be found working as a K-9 Handler Police Officer. Scott is also a licensed paramedic. In his spare time, he enjoys fishing, hunting, and relic hunting. 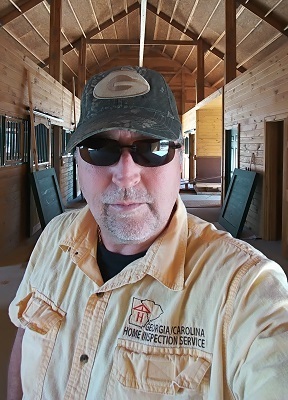 Being a home inspector throughout CSRA has introduced Scott to thousands of local area buyers, sellers, and lenders. When he started Georgia Carolina Home Inspection Service, he helped fill a very pressing need in the local area. More than 20 years later, he’s still passionate about ensuring each customer has the necessary information to make the right decision. You’re welcome to join Scott as he inspects your potential future home. Once you receive your home inspection report, you can also contact him at any time to ask questions or get clarification. Scott uses the latest technology such as Create Request List™. You won’t have to wait more than 24 hours to find out if the house you’re interested in is really a dream come true or a nightmare you should completely avoid.